Wednesday, July 25, 2018 at 4:44 p.m.
Monmouth University’s Computer Science and Software Engineering Department is encouraging schools and parents to join in on the largest learning event in history: The Hour of Code. Several campus sessions have been scheduled where parents and children can complete an Hour of Code activity together. University students and faculty will be available to answer questions as participants complete the self-guided coding experience. Workshops will be held on campus on Thursday, December 11, 6 to 7 p.m. and Friday, December 12, from 5 to 6 p.m.
Seats are limited for these campus sessions and reservations are required by calling 732-571-7501. For more information, contact Computer Science and Software Engineering Professor Jamie Kretsch at 732-571-7501 or send e-mail to jkretsch@monmouth.edu. 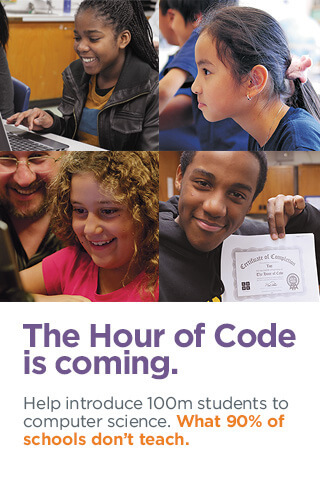 For more information about Hour of Code, visit hourofcode.org. RSVP Information: Not required, though you may register at Technical Talk – Digital Forensics at the Intersection of Public Policy and Civil Rights. This event will feature networking and refreshments, guest speaker, and Q & A. Digital forensics is a rapidly expanding field where practitioners apply scientific techniques in order to investigate and draw conclusions about evidence, with the goal of presenting findings in courtroom settings. The manner in which the forensics expert is required to perform their work is greatly influenced by prior court rulings and government laws, both recent and older ones dating back to the Nation’s founding. Some public policy and civil rights issues related to computers and digital data will be explored using examples from the speaker’s casework, as well as newsworthy current events. Dr. Rebecca Mercuri is the owner of Notable Software, Inc. where she provides digital forensics investigations and expert witness services for criminal and civil matters, along with computer security and certification compliance evaluations. Education includes a BS in Computer Science from Penn State, MS in Computer Science from Drexel University, as well as an MS in Engineering and PhD from the University of Pennsylvania. During 2003-2005 she was a fellow at Harvard University, performing research on computer security topics, and has testified to local, state and federal government agencies on the many inherent problems with electronic voting systems. Her sworn testimony in Bush v. Gore was cited in briefs to the U.S. Supreme Court. Dr. Mercuri’s publications include a book chapter on Digital Image Forensics, and numerous Security Watch and Inside Risks articles for the Communications of the ACM magazine, where she also served as a Contributing Editor. Rebecca has held leadership roles with the Association of Computing Machinery, the Institute for Electrical and Electronics Engineers, and the Audio Engineering Society, and is a frequent presenter at conferences and events promoting STEM education. Current hobbies include guitar and vocal music, droning, 3D printing, and amateur/Ham radio. For more information, please contact Rebecca Hanly, CSSE Secretary at x7501 or rhanly@monmouth.edu. Monmouth University’s Department of Computer Science & Software Engineering (CSSE), in partnership with Random Hacks of Kindness, Jr (RHoKJr), presents a free STEM workshop for girls in grades 4th through 8th on Saturday, October 28, 2017 from 8:30 a.m. – 3:30 p.m. in Edison Hall Room 201. Girls will have the opportunity to team up as problem solvers and innovators to develop Smartphone app prototypes to benefit local nonprofit organizations. Computer science mentors, drawn from current CSSE students, will teach the girls how to “code for a cause” as they work with representatives from local non-profits such as STEAMpark, Lunch Break, and Coastal Communities Family Success Center. If you have questions, please contact CSSE Secretary Rebecca Hanly at rhanly@monmouth.edu or call 732-571-7501.